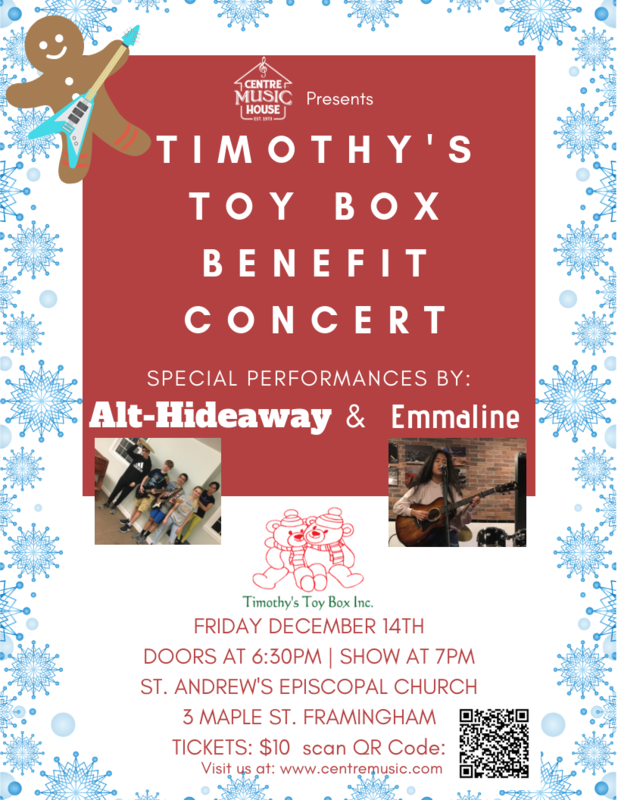 To celebrate the season of giving, Centre Music House presents the Timothy's Toy Box Benefit Concert! The event will be held at the St. Andrew's Episcopal Church on December 14th at 6:30pm to help raise money and awareness for Timothy's Toy Box. The Centre Music House Band, Alt-Hideaway, will headline the concert with opening act, Emmaline. Timothy's Toy Box is a Framingham-based non-profit organization with a mission of giving toys to children during the holiday season who wouldn't otherwise receive them. These toys are provided to children in hospitals, homeless shelters, schools, and churches. All proceeds from this event will go to Timothy's Toy Box, Inc. and help them in their mission of providing toys to children during the holiday season! Additional donations are greatly appreciated and will be accepted at this event.